Glen Innes Pistol Club Treasurer Wayne Unicomb, left, President Jason Tom and Northern Tablelands MP Adam Marshall at the club over the weekend. 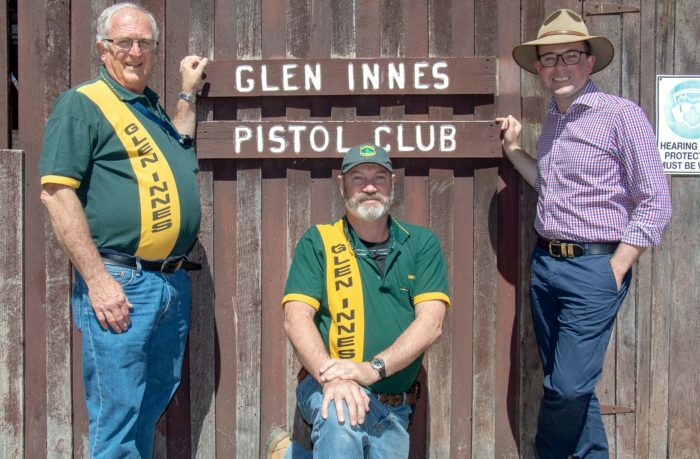 NORTHERN Tablelands MP Adam Marshall says an $8,243 NSW Government grant for the Glen Innes Pistol Club has hit the mark in their target to achieve greater range safety and meet national standards for larger shoots. Mr Marshall said the upgrades would give the club a bigger shot at hosting national events in the future and attracting even more out-of-town shooters. “The funds allow the club to fully reconstruct a retaining wall that complies with firearms range safety standards and that’s a big step forward,” Mr Marshall said. “The old log wall was built years ago but the logs had rotted and were collapsing from the weather and white ants. Club Treasurer Wayne Unicomb said the new 37-metre retaining wall won’t need ongoing maintenance. “We’re thrilled with this funding because we were worried that the whole wall would collapse,” Mr Unicomb said. Mr Marshall said the club shoots every weekend, has about 40 members, but is growing in reputation and in attracting more shooters from outside the area to their big match weekends. “A shoot there last weekend actually broke the record for the numbers of shooters, which had been set last year, so the club is growing and it is appealing to more shooters from more areas,” Mr Marshall said. Mr Unicomb said the recent shoot had attracted two Commonwealth Games medallists and the club wanted to build on that attraction in the future. The latest funding for the pistol club came via the NSW Government’s Crown Reserves Improvement Fund and was one of 22 projects announced by Mr Marshall for clubs in his electorate that were sharing in over $700,000 from this year’s program.